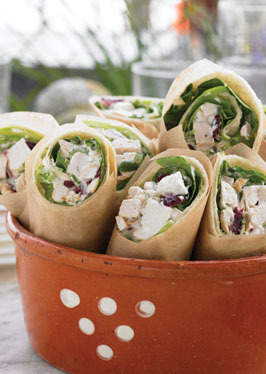 Combine chicken, mayonnaise, Crema Agria, celery, cranberries and green onions; mix well. Divide mixture into fourths; stuff 1/4 of mixture into each pita pocket; add lettuce. Tip: Use as filling for appetizers; wrap in lettuce leaves, spead on pita chips, or spoon on cucumber round.